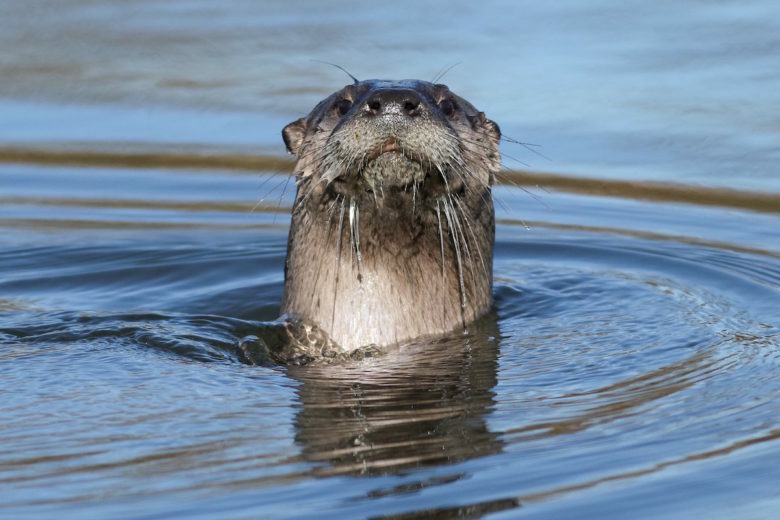 The Nys brothers won’t get to catch and release Coho salmon in their favorite spot on the Clatskanie River anymore, because the otters are eating the fish. The section of river in question runs downstream from the tree farm in Columbia County, managed by VanNatta Brothers Logging. 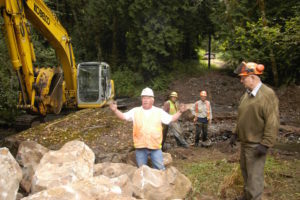 It is also where the VanNatta Brothers, Oregon Department of Fish and Wildlife (ODFW), staff at the Columbia Soil and Water Conservation District and volunteers from the Lower Columbia River Watershed Council collectively spent $13,000 to help get the Coho to re-inhabit the stream. Ironic you might say? 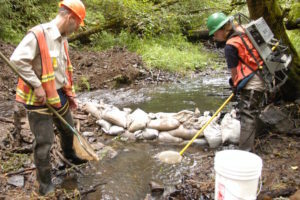 Woodland landowners, following the Oregon Forest Practices Act of 1971, volunteer their time and money to do what they can to restore fish habitat. 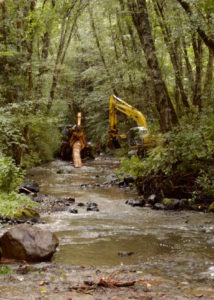 They take hundreds of acres out of economic production to ensure that streams are adequately shaded. They remove age-old barriers that prevent fish moving upstream to spawn. They add woody debris into the streams to form pools where young fish can protect themselves from predators. The photos you see here were taken on August 22, 2004, when KC and Jeff VanNatta, ODF, Kynsi Construction and watershed volunteers removed a concrete slab (used in the 1940s as a way to cross the river) and added woody debris to replace what was taken out in the late 50s and early 60s. Research tells us both the Coho and the otter have been around for thousands of years. Perhaps the moral of the story is to make sure our streams and rivers are healthy and let its natural inhabitants duke it out. Either way, everyone was thrilled to see Coho salmon back in the Clatskanie River. None were more thrilled than the otters.